Catla is the only fish of the Gibelion genus from the carp family of Cyprindae. It has three scientific names — the Gibelion catla, Cyprinus catla and catla catla. In its native India it is often referred to as the Bhakur. Other countries the fish is native to include Pakistan, Nepal, Myanmar and Bangladesh. The catla can grow to be 6 feet in length and weigh up to 38 kg. It has oddly large scales and a very long pectoral fin. The entirety of the body is dark gray/green. Its most recognizable feature is its large lower jaw which forces its lower lip to be upturned, covering its mouth. It is harmless to humans. In the wild, this freshwater fish is only found in rivers, lakes and ponds. It is omnivorous and will eat insects, plankton and any other assorted biological material that is floating on the surface of the water. It is mostly a surface-dwelling fish, and prefers very warm waters in the 64 to 82 degrees Fahrenheit range. During monsoon season, usually May until August depending on the region, the fish will partake in its spawning migration, moving towards shallow waters. The fish is a popular food fish in India, and has been introduced to ponds and other bodies of water for farming purposes. 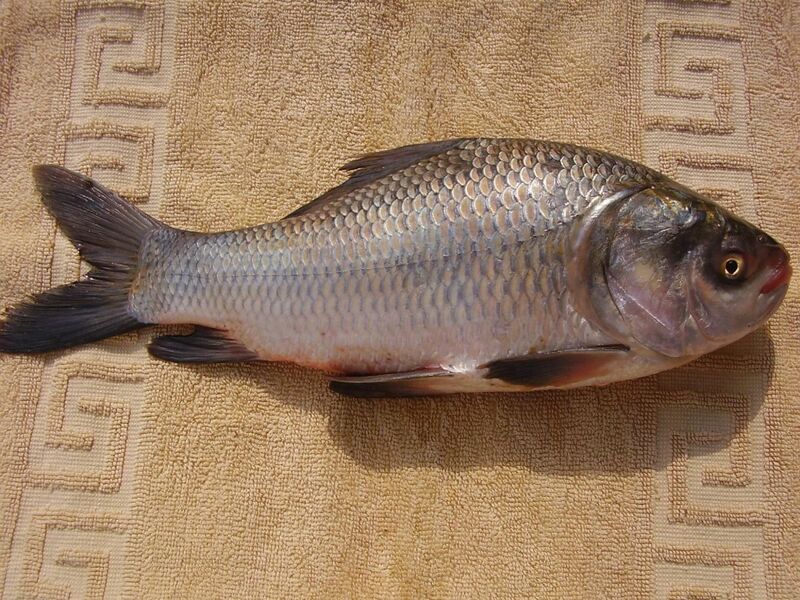 Many times it is introduced in fish farms with multiple carp species, as it eats the organic material that floats on the surface of the water that most other fish will not. The fish is usually harvested when it weighs 1 to 2 kg. After it is purchased the fish can be prepared in any number of ways, and it often fried or baked, mixed in with vegetables and other foods. Compared to many other types of fish in India it is very cheap and plentiful, but the market for exporting it to other countries and regions is slim because of the costs involved with moving large quantities of freshly caught fish. Because of this it is not often exported to other countries outside of India. Populations of catla are very large throughout India and every country it is native to. Despite this it is rarely caught by sports fishermen. Large catches are even rarer, making the fish a prized and sought-after catch for many sport fishermen who visit the area looking for unusual and one-of-a-kind catches. Recipes using catla fish see Here and Here.